Well, the times they are a changin’….Or at least, this blog it is a changing. Tomorrow, and through the weekend, I will be implementing some pretty big changes to the look and structure of this blog. It will be easier to find the posts with recipes, the monthly to do lists, or the articles on specific topics like chickens, fruit growing, etc. You will be able to convert posts into print-friendly or pdf formats easily (good for the recipe posts) and edit out extra text or pictures before printing. Threaded commenting! This means you can reply directly to a comment instead of having a reply get shoved to the bottom of the list. Fast load times. I am told by technical people that the site should load quickly. You’re not losing a thing. The name is staying the same, all the old content and all the old comments should remain, and the existing URLs should work…eventually…we hope. A big learning curve as I get up to speed on what it takes to build and maintain a self-hosted (as opposed to Blogger-hosted) web site. Big learning curve. But fun. Scalability. This will make it possible for me to bring new site features on-line going forward as the blog continues to grow and evolve. Direct feedback. I am super excited about threaded commenting. I’ve long wanted to be able to be more responsive to reader comments, so the ability to reply directly is huge. It’s actually what pushed me to begin this site migration process. Better SEO (Search Engine Optimization). Basically, more people should be able to find my posts on gardening, cooking, etc. through web searches. And that will help veggie gardeners take over the world….mwaaa haaa haaa! Cost. Yup, this is gonna cost me some money for hosting services, domain registry, etc. That’s cool, I knew what I was signing up for, but if you value the content, and want to help me defray the additional expenses and help keep this blog ad-free, you can throw a few bucks in the tip jar ($6 covers hosting costs for a month, anything at all is appreciated beyond words). Also helpful: if you have something that you would be buying anyway on Amazon, and you do so through my storefront, about 4% of your purchase price is sent my way. And you don’t have to buy what I link to…as long as you hit up Amazon through my site, almost any purchase counts. Patience. There will probably be times in the next several days where things look weird, or content is temporarily not found at its original URLs. There is some backend stuff happening that mean the interwebs may not know where NW Edible lives for a while. This should work itself out over the weekend but I cannot guarantee things won’t be funky next week. I may be fiddling with blog look for a while, and it may take a week or so to get all the old content tagged and categorized properly. Feedback. Give me until Monday, but starting next week, and going forward, if something isn’t working, or if things look all hashed up on your computer, please, please tell me. There are hundreds (thousands?) of you and one of me (well, two of us, since Homebrew Husband is helping), so you will probably catch something we missed. If you do, help us fix it by alerting us to the weirdness. Hopefully, nothing else. If everything goes well, all of you who subscribe through an RSS feed, or follow through Google Friend Connect will continue to receive your posts as you have. 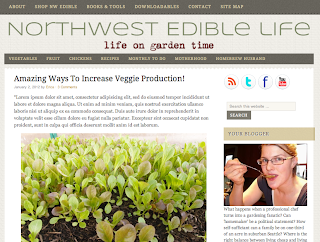 If you are a subscriber and your daily dose of NW Edible stops appearing in your email box or your reader, please tell me. Thanks you guys, I’m looking forward to unveiling the new site next week. Wish me luck, and have a great weekend! "And that will help veggie gardeners take over the world….mwaaa haaa haaa!" Yay for thread commenting. I added it to my blog. I'm not sure if I like the one I chose, but there are others to try if I don't. I think it's a great feature, though. This sounds really exciting. As a new blogger too, I am still figuring out the ins and outs right now. I keep my fingers crossed that all goes as planned for you. I love the preview, and can't wait for the big HGTV style "reveal"! Sounds like some fun updates – I love threaded commenting too. Yay! Other big news – tomorrow the debut issue of American Virtue Magazine will go live, which includes your piece! If you would be willing to help spread the word, let folks know they can sign up for the free e-news at http://www.AmericanVirtueMagazine.com and they'll get the notifications of the digital issue's arrival Friday! And thank you again for participating in our Taking the Hill column there! Best of luck, hope the transition goes smoothly! Let me know if you want to know who we’re hosting through, etc. Best wishes for a smooth weekend! You're a natty babe. Props from this winter-napping, pudding-eating old householder. It is clear I am out of my league with the youngsters but I got to admit, pretty damn impressive. Congratulations! Looks nice! Clean. Crisp. The muted colors are lovely. I almost chose the fabric theme for mine – nice homey vibe. WordPress is pretty intuitive. I don’t think you’ll have much trouble picking up the bits and bobs. Thanks Felicia. So far so good with WP…just when I think, “Wow, I just wish there was a way to….” I figure it out. Good user community, too. I think this will give the blog a good solid framework heading forward. And just when I thought it couldn’t get any better…. Just wandered by and having missed the warning post a couple days ago, felt like a kid who came home and found everything redecorated. Very nice new digs. Good Luck, Erica! Like you don’t already have enough to keep you busy. Serieously, all the best, and if I can help, just let me know. Change is good. I’ve been contemplating making a few more changes to my own blog.